Notice: This web page is being transitioned to a new server - expect some interruption in service and image/movie updates. This feature consists of "movies" of images taken at the same point in the day which, over time, will show the changing of the seasons. Click here to see these movies. Click on one of the above images for a full-size version. If the image isn't updated when you click on it, hit the "Reload" or "Refresh" button on your browser. Please note that these images are not live, but updated every five minutes. A "FlightAware" airplane tracking system is now operational from the cabin - click here to go to its status page. See the Detailed Weather Conditions at the cabin. Note: Work is being done on some of the cameras so one or more of them may be offline. The Valley Cam. 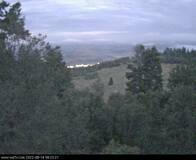 This camera looks to the west, across upper Sanpete valley with the west edge of Fairview being visible. 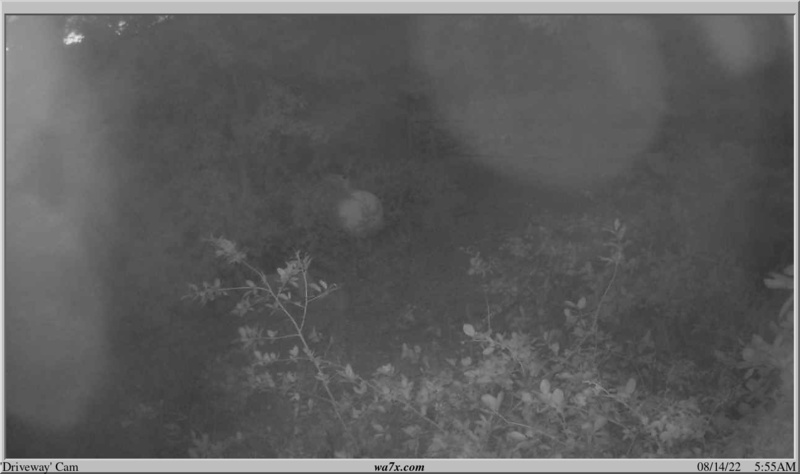 This camera has good low light sensitivity and the valley is visible on moonlit nights, but on moonless/cloudy nights it can look a bit noisy. Click here to see a time-lapse loop from this camera, courtesy of the NWS Live Weather page. The "North" Cam. This camera is pointed to the northeast, roughly along the road. On moonlight nights this will see the landscape, but it can look rather noisy on moonless and/or cloudy nights. The Southwest cam. This camera may be pointed in various directions - sometimes at a hummingbird feeder and other times in the general direction of the main snowstick. It has pointed toward the southwest in the past, hence the name, but we decided to stop renaming it every time we changed it. The "Snowstick" cam. During the winter, the camera looking in this direction shows a snowstick south of the cabin. 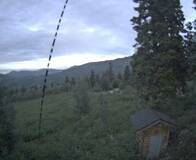 Click here to see a time-lapse loop from this camera, courtesy of the NWS Live Weather page. This snowstick has reflective tape at the 6" points on the black sections which are lit up by the camera's illuminator, so be sure to take this into account when estimating snow depth at night. The "Snowstick2" cam. This camera looks to the north at another snowstick planted in that direction during the winter. When the snowstick is present, its reflective tape on the camera can cause a double image to appear at night. 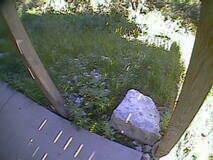 The "Meadow" cam. 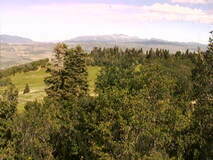 This camera is pointed to the northwest and in it can be seen Spanish Fork Peak in the distance, near the center. 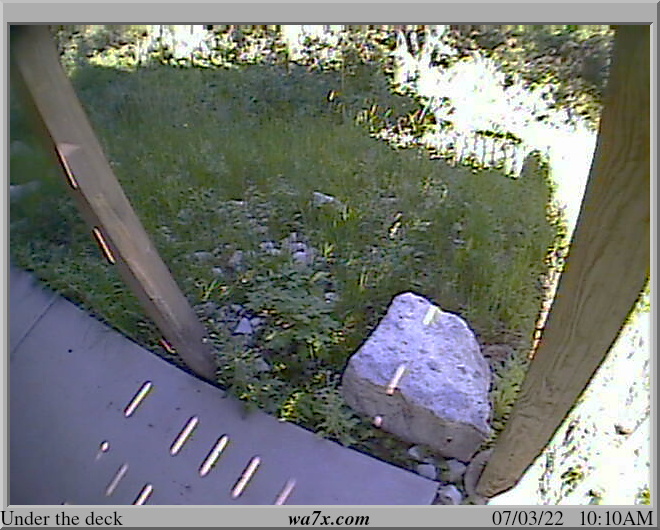 The "Under the deck" cam. 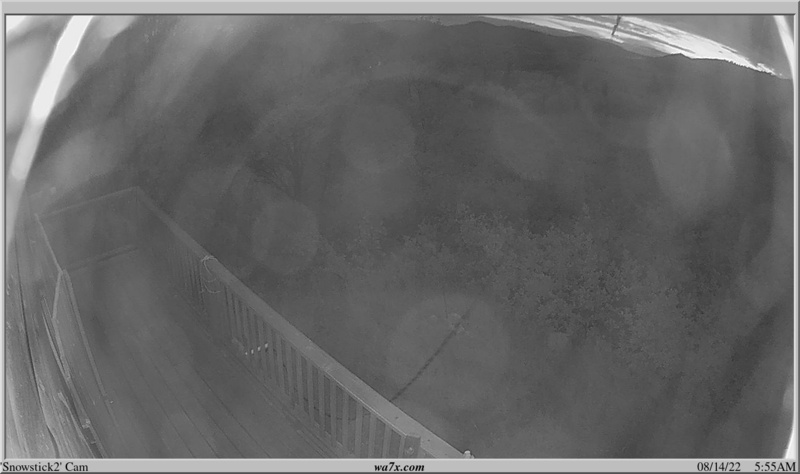 This camera looks under the deck, pointed roughly to the southwest. It is used to help judge snow depth and drifting. The Driveway cam. This looks northeast-ish, up the driveway. Note that the times shown in the pictures/movies are in Mountain Time. New: Time-Lapse movie-of-the-day! See the sidebar below and to the right. This picture (not live) shows how the nine-foot snowsticks may be used to estimate snow depth on-site. Note the bands midway between foot markings. There are LEDs on the foot markings (1-9) that allow snow depth to be roughly measured at night. On the south snowstick, reflective tape at the 6" marks on the sections of black pipe look like lights, so be sure to take that into account when estimating snow depth at night. Always count down from the top of the snowstick! How do I save the picture that I see? First, click on the thumbnail-sized picture to get the full-sized version. Next, right-click on the large picture. There, select "Save Image As" or "Save Picture As"
This will allow you to save the picture to the location that you choose. Please note that the pictures update automatically, every 5 minutes, so if you see a picture that you like, you should grab it immediately and save it before it goes away! If there was a picture that you had to have but missed, it may be possible to pull it from the archive. You can send a note to the email address below to request the picture, but you must know the exact date and time, which camera it was, and what it was about the picture that you found so interesting. The "Movie of the day" and the "Passing of the Seasons". To see the "Movie" of the day for a particular camera, click on the picture and follow the link. This is a new (and experimental!) feature in which you can see a time-lapse of everything that's happened on the camera up to that point in the day. You can also see time-lapse movies of "yesterday" and "the day before." When you click on a movie it should start a player within your browser: If not, you may need to update it. It has been noticed that better playback results may sometimes be had if you save the movie to disk and then play it using a program other than your browser - but your mileage may vary! The movie is updated once-per-hour and is available by about 10 minutes past, showing everything from just before sunrise to the most recent picture at the moment that the movie was produced and continuing until just after sunset. No new movies are made during the night. As soon as the first movie of the day is made in the morning, the previous days' movies are made available as "yesterday's" and "the day before yesterday's" movies. There is another new feature - The Passing of the Seasons. 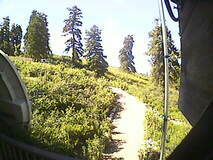 For this, a new picture from each camera - taken at 12:00 noon (Mountain Standard Time) is added to the movie every day. For the "Valley Cam" there is also the "Sunset" picture that is taken every day a few minutes before sunset. These movies were started at the end of December 2010 and are growing every day. Click here to see the "Passing of the Seasons" movies. Note that the times and dates on the pictures and time-lapse movies are Mountain Standard Time! In addition to the "Time-Lapse movie-of-the-day" there are the NWS (National Weather Service)-provided time-lapses vidoes as well. We greatly appreciate the NWS posting these (and many other) cameras on their web site. Here are some video clips of the November 18, 2009 Bolide ("meteor fireball") that was visible across several western states. In several of the scenes on the above links you can see the sky light up to a "normal" daylight blue color - at midnight! : If one of those frames were taken by itself, you wouldn't know that it was midnight from the "look" of the picture alone! Dramatic Pictures/video from the August 1, 2006 Storm from the Millcreek area of Salt Lake. The Fire Siren is now operational - Look at the Fire Siren page for more info! Click here for pictures of the Thad's Peak fire of 2002. Last page update: 20181128 All images/videos/text at the wa7x.com web sites and pages are copyrighted and all rights reserved. For comments and feedback on this page, you may contact Glen via Email.